Por eso floto como las estrellas roto, como una veleta y vuelo por tus ojos a estallar. One afternoon in 2007, perhaps by coincidences of life or an exquisite plan of destiny, three musicians and an anthropologist found themselves in a Colombian town near the captial city of Bogotá, talking about life, music and experimentation. Nicolás Junca (guitar), Santiago Prieto (producer, strings) and Camilo Parra (winds, co-producer) played their instruments, and suddenly Catalina Garcia (she did not know she could sing), opened her mouth to begin what the band considers a constant process of growth and learning. Monsieur Periné’s music is a fusion of colorful rhythms that’s an interpretation of music from France in the thirties and forties, specifically inspired by Django Reinhart. Jazz manoche, gypsy swing mixed with popular Latin American music, bossa nova, Cuban son, salsa, cumbia, porro, bolero, Colombian rock and traditional sounds all come together to create what they call “Suin a la Colombiana,” and the band sings in four languages (French, Portuguese, English and Spanish). 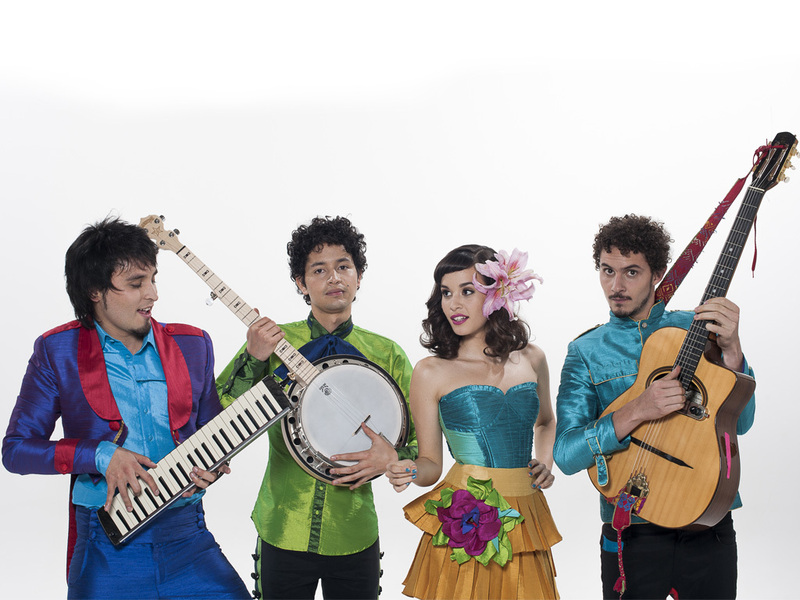 In 2012 they released their first CD "Hecho a Mano." A few months later, and at a time when CD sales were at a global low, Monsieur Periné received a gold disc in Colombia for selling over 10,000 copies. MTV Iggy gave them the Artist of the Week, in 2011 they had the number one song “La Muerte” in national public radio Radiónica, the hit “Suin Romanticón” earned more than 2 million views on YouTube, and Vimeo gave the the Staff Pick for “La Muerte” official video. In 2013 the band embarked on a European tour called Tour Huracán 2013, with more than 25 concerts across the old continent. Rounding off the band’s lineup are Fabian Penaranda on bass, and percussionist Miguel Guerra.